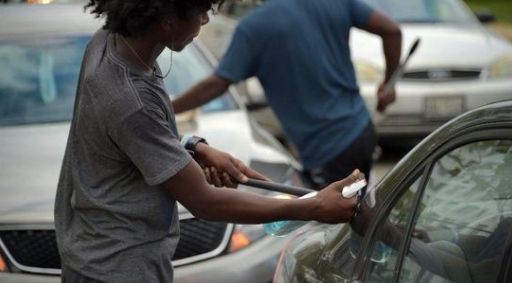 How would you feel if a “squeegee boy” kicked in your car door? This one hit close to home recently. One of my sons works downtown in Baltimore’s Harbor East complex … his office building is across from the posh Four Seasons Hotel. His morning commute is about an hour … with the last leg running through Baltimore’s city streets. The finish line is thru a busy intersection – the only way to his workplace. One morning, when he was “almost there”, my son’s car was surrounded by a band of squeegee boys “offering” to to clean his windshield … for a “tip”, of course. When he said “no, thanks”, one of them kicked in his car door … not just “kicked” … “kicked in”. A police report was filed … with no expectation of any action. Final repair bill: $3,500 … and bye-bye to “accident forgiveness”. Chatting with folks, turns out that my son’s experience isn’t that unusual. Worst case: woman had her passenger’s side window broken and purse stolen. She chased after the perp (bad idea) and retrieved her purse … only to return to the spot where her car used to be. It was gone … stolen … never to be seen again. Baltimore newspapers acknowledge that the problems caused by the squeegee boys are increasing in frequency and severity. So, why don’t the cops do something about it? Bottom line: Government honchos have directed them to stand down … and, are even supporting the the squeegee boys with financial assistance. Rationale: the squeegee boys are “showing ambition” and “providing a community service”. Would you rather have them doing worse stuff back on their home turf? After all, when you’re one of the murder capitals of the country … it’s hard to get excited if some cars get stolen or vandalized. That is, unless you’re one of the victims. Then, you think about changing jobs if your company doesn’t move to a safer suburban location. Gulianni proved the point in NYC: sometimes, fixing the big stuff starts with fixing the little stuff. Baltimore should take note … or, not be surprised as it’s death spiral continues. This entry was posted on November 26, 2018 at 6:55 am and is filed under Squeegee Boys. You can follow any responses to this entry through the RSS 2.0 feed. You can leave a response, or trackback from your own site. Step 1 – next time you’re out, stop at a bank and ask for change of a $20 in singles. Keep a few bills above your visor, and the rest in your glovebox. Step 2 – when you stop at an intersection where squeegee boys are working, waive one of them over and roll down your window. Step 4 – hand him a dollar, thank him for cleaning your window, and wish him good luck. No one’s car gets damaged, and no one has to degrade themselves to the point of revenge-vandalism. You get to avoid that awkward I-should-but-I-don’t-want-to feeling as you try to non-verbally communicate that your windshield is already sufficiently dirt-free. Plus, you get the benefits of being a force that pushes that kid in the RIGHT direction. He comes away with a buck and some idea of how to make his life better. You’ll be surprised how long a $20-spot will last you. And if you feel like you want to make a REAL difference, keep a stash of $5’s in your glovebox – at least that’s enough for a warm meal someplace. Whether it’s $1 or $5, doing something nice for someone in need sure feels better than chasing someone through the streets or taking your car to the repair shop “on principle”. And by the way, this tactic also works great with the homeless.